Featuring: Richard Pryor, John Candy. Director: Walter Hill. Warning: This movie will stop streaming on May 11th so act fast! At some point I think we've all fantasized about what we would do if we suddenly came into millions of dollars. Before I'm even done picking my lottery numbers I usually have most of the money spent in my mind already. It's fun to think of the crazy stuff we would do if we suddenly had unlimited resources. 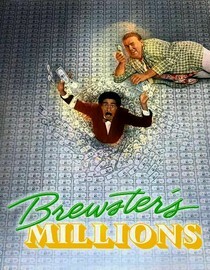 Brewster's Millions is a buddy comedy starring Richard Pryor and John Candy that explores that fantasy. Pryor stars in this movie as a washed-up minor league baseball player who unexpectedly comes into a huge inheritance with the caveat being that he has to spend 30 million dollars in 30 days to get the full 300 million. Extravagance, hi-jinx and light moral lessons ensue. This is probably one of Richard Pryor's most consistent comedies and there are laughs throughout the movie. And really, if John Candy is in something you know it's going to be a great time. This is an above average 80's comedy that will have you and your friends sitting around talking about what you would do with 30 million dollars. That's really what is most fun about this movie. According to Netflix this movie will stop streaming on 5/11/11. Of course, sometimes they lie. Why is it in your queue? Taylor from Netflix Streaming recommended it. Is it artsy? Nope, it's an entertaining buddy comedy with Pryor and Candy. What stood out the most to you? How much it made me want 30 million dollars. What mood should I be in to watch this movie? Looking for a pleasant comedy that everyone can enjoy. What rating did you give it on Netflix? 3 Stars. This was one of my favorite movies as a kid, and I still love it today. Ha, that's a good point! It's kind of crazy to say that we know how to do excess even better than we did in the 80's but it's true!